Extra virgin coconut oil is used to protect and heal the skin starting from the inside. Coconut oil is anti-bacterial and anti-microbial and has antioxidants that work to combat the signs of aging. The oil is easily absorbed into the skin due to its relatively small molecular structure. Coconut oil has a smooth, silky texture and a rich, tropical scent. It is nourishing, healing and soothing for the body and face. Coconut oil contains saturated fats such as lauric acid, caprylic acid and capric acid. It also contains large amounts of triglycerides, proteins, antioxidants and vitamin E. Lauric acid and capric acid are both anti-bacterial and anti-microbial. According to Coconut-Connections.com, these antioxidants combat the effects of aging by thwarting free radicals that cause the connective tissues in the skin to harden. Coconut oil's small molecular structure allows the vitamin E and protein to rejuvenate and soothe the skin. The skin secretes oil naturally through the sebum glands. These glands prevent the skin from becoming cracked and dry. When the sebum glands become inhibited by bacterial infections, the result is acne, which often leads to redness and painful swelling. According to Organicfacts.net, the anti-bacterial properties found in coconut oil, particularly from the capric and lauric acid, help put a stop to the bacterial infections. This allows the glands to function correctly and prevent outbreaks of acne. When skin becomes dry, it is vulnerable to infection. The sebum glands produce oil that keeps harmful bacteria at bay while maintaining the good bacteria. Coconut oil has a similar pH balance and mid-chain fatty acid structure that affects the oil that is secreted by the skin. After you shower using dry or bar soaps, your skin is at a greater risk of dryness or infection due to the natural oils being washed away. 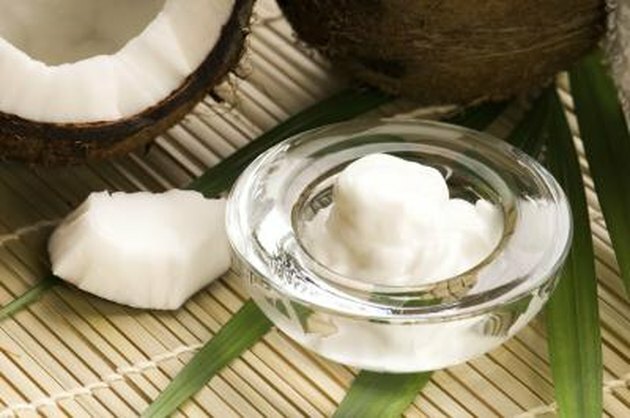 Coconut oil replenishes the skin's much-needed oils while moisturizing and keeping the skin's pH at the correct balance. You can combat and prevent bacterial and microbial infections by using coconut oil on the skin. Infections can be unsightly and painful. From fungal and bacterial infections to acne, coconut oil can aid in healing the skin. According to Bruce Fife, coconut oil can fight ringworm, athlete's foot and other infections effectively. The properties that fight the infection on acne-prone skin are the same for other skin infections. Young skin is supple, strong and elastic. Over the course of time, the connective tissues in the skin become harmed by free radicals. This leads to the loss of elasticity and hardening, which is what shows the signs of aging. Coconut oil provides antioxidants by penetrating the skin. This leads to skin that is elastic and soft because the skin's connective tissues are strengthened. Brown liver spots on the skin that occur as you get older are a result of the oxidation of proteins and polyunsaturated fats. Coconut oil's antioxidant properties can slow the emergence of these spots by hindering oxidation. According to Coconut Connection, the term "extra virgin" is misleading to consumers. You typically hear the term "extra virgin" when referring to olive oil, which is from where the term "extra virgin coconut oil" is borrowed. "Virgin" means the original product--in this instance coconut oil that has not been touched, changed or modified much from its original form and is not hydrogenated. "Extra virgin" simply does not exist when it comes to coconut oil. Plain and simple, it's either pure and untouched or it's processed. Coconut Connections: What's All The Fuss About Virgin Coconut Oil?